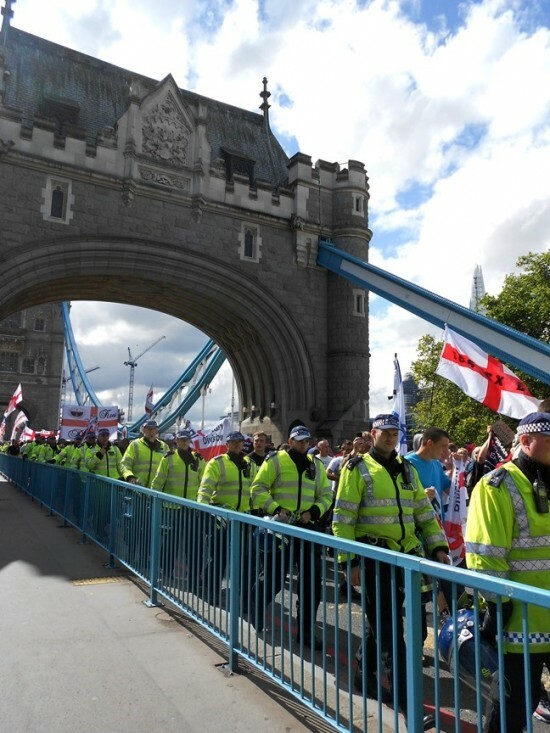 The English Defence League marched across Tower Bridge in London today and held a demo on the outskirts of the heavily enriched borough of Tower Hamlets. 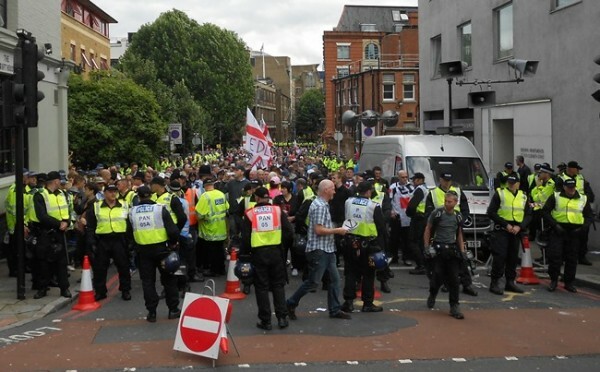 As usual, Muslim and UAF protesters scuffled with police while attempting to reach the EDL demonstrators. Tommy Robinson, the leader of the EDL, was arrested for incitement [his speech ran 5 minutes over his allotted time] and was still being held at the police station this evening. To Tower Bridge for the EDL’s second attempt to march and demonstrate against sharia law and other nasties in the London Borough of Tower Hamlets. Frankly, this was 1936 in reverse. In 1936 Sir Oswald Mosley and his blackshirts of the British Union of Fascists wanted to march (in uniform, as well) from the Tower Of London to Victoria Park (which straddles the two boroughs of Hackney and Bethnal Green). They tried several routes but were stopped at Whitechapel and in Cable Street, which being so far south was not an obvious route to take. The police advised Mosley to turn back and the march was cancelled. While the incident is known as the Battle of Cable Street most of the old newsreel showing the fighting was filmed by the Royal Mint and at Gardener’s Corner, outside a department store (long gone) at the junction of Commercial Road and Aldgate. Then, the blackshirts marched on the East End and were stopped. Now the black flags of jihad and anarchy, the black veils and cloaks of sharia hold the East End and it was the descendants of the Londoners who stopped Mosley who were trying to enter. Naturally all sorts of counter-protests went off, though the police kept things from turning into a riot. The nerve of these EDL types, wanting White Christian Europe to remain White Christian Europe. How dare they!?! I am no expert in understanding what the EDL (and by extension, all the other European nation’s Defense Leagues) are all about ... but they get painted with some pretty vile colors in the press. Fascists, racists, moronic skinheads, violent drunkards and layabouts. The New KKK. And worse. And yet they seem to be just about the only groups on the whole continent who understand that their cultures are being destroyed by PC and the pisslamic infitada/diaspora. They are against letting Europe become Eurabia, so probably I should give them my support. Meanwhile ... Sweden rolls over and slits its own throat? Sweden on Tuesday became the first European Union country to announce it will give asylum to all Syrian refugees who apply. “All Syrian asylum seekers who apply for asylum in Sweden will get it,” Annie Hoernblad, the spokesperson for Sweden’s migration agency, told AFP. The decision, which will give refugees permanent resident status, is valid until further notice, added Hoernblad. Until now, Sweden could only house refugees temporarily for three years, after each individual case was evaluated by the state. The agency expects that the “vast majority of Syrian nationals who today have provisional status will apply for permanent status,” said Hoernblad. Those granted permanent status will also be allowed to bring their families to Sweden. The move came as the United Nations said the number of refugees fleeing the conflict in Syria had passed two million, which the UN High Commissioner for Refugees, Antonio Guterres, called “the great tragedy of this century”. Since 2012, Sweden has taken in some 14,700 asylum seekers from Syria. So with a stroke of a pen, Sweden just became Palestine II. And while they think they’re doing a great act of humanitarianism, what they’ve really done is far more than let the camel’s nose into the tent. They’ve just flushed 1300 years of their own culture down the crapper, and invited the vampires into their homes. Horry Clap. I give them 5 years, 10 at the most. 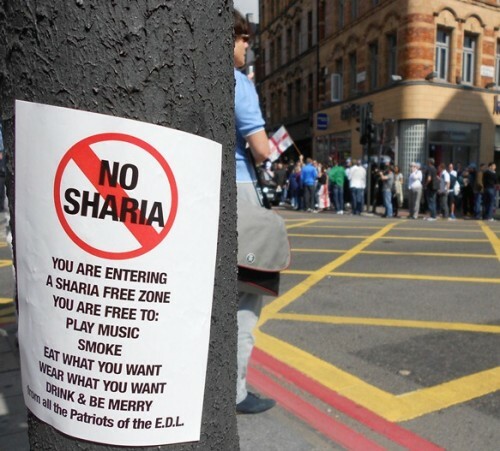 What’s the point of any EDL if the governments are going to cave this forcefully? Do none of these idiots see the problems that are guaranteed to come along, hand in glove, with this act? Do they pay no attention at all to the crime stats next door in Norway? Sometimes, I just want to give up.